Daily Bread Run - Volunteers pick up a cart or two full of bread donated by a nearby grocery and deliver it to a different social service agency every day of the week. Monthly dinners for the Hope’s Door counseling group - We provide a meal for 10-15 staff members who assist women who have experienced family violence. Two routes twice a month of Meals on Wheels - We deliver hot meals to homebound individuals and seniors through Allen community Outreach. Card Workshop - We host a card workshop four times a year to make cards to show our appreciation for our American soldiers and other ministries. Soldier Ministry - This ministry is dedicated to showing love and support to our American women and men serving in the armed forces by welcoming them home at the DFW airport, providing care packages for them and more. We are currently working on expanding this ministry. Baking Ministry - Volunteers provide the teachers at Boyd Elementary and the staff at Collin County Children’s Advocacy Center homemade treats the first Tuesday of every month along with cards of support and encouragement. Partnership with ZOE ministry- A ministry that helps orphans in Africa. Click here to visit the blog. 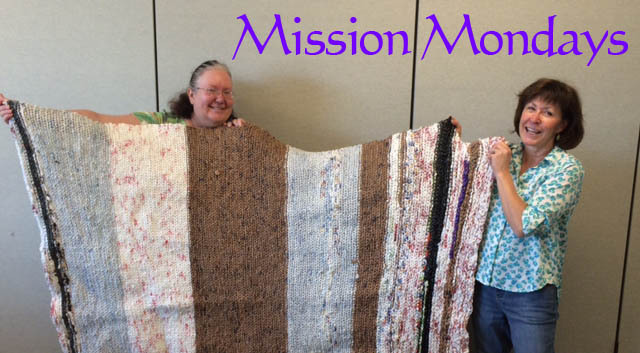 Join us for great fellowship while we create all forms of items to help others including prayer shawls, homeless mats, greeting cards, fleece blankets and so much more. No skill is required. Every Monday morning 10:30 a.m. - 12:00 p.m. in room C128. Above photo is of our first homeless mat made entirely out of grocery sacks by Stacie Scaduto. Wheelchair ramp - Suncreek volunteers travel to the Dallas area to build a wheelchair ramp to enable a handicapped person easier access into their home. Christmas Family Connection - Each year members of Suncreek partner with families associated with Trinity River Mission in West Dallas to help them have a happier Christmas. The families from Trinity River Mission perform numerous service hours in order to participate in this event. Christmas Alternative Gift Fair - This is a wonderful way to put Christ back into your Christmas gift giving. You can support various mission projects and ministries in honor of your loved ones and purchase hand crafted items that support various ministries around the world. Boyd Summer Lunch Program - Each summer Suncreek volunteers provide a week of food, games and crafts for the children of Boyd Elementary. This year the event for Suncreek will be June 5-9, 2017, 11:30-1:00 at Boyd Elementary. Make plans to join us! Senior Citizen Luncheon - The second Tuesday of every January Suncreek members provide lunch and entertainment for the Allen senior citizens. Bake Sale for Juarez Christmas: The Sunday before Thanksgiving each year the missions committee hosts a bake sale to raise money to help the citizens served by Proyecto Abrigo in Mexico have a brighter Christmas. Blood Drives - Suncreek missions hosts a blood drive for Carter Blood Care every fall and spring. Back to School Party at Trinity River Mission - Suncreek UMC hosted the first annual back to school party at Trinity River Mission in August 2009. It is a fun time of fellowship, crafts, and distributing school supplies. The families of TRM have performed numerous service hours in order to participate in this project. Allen Shoe Ministry - Suncreek missions works in partnership with the church and society committee at Suncreek to provide new shoes for children in Allen March of each year. Suncreek volunteers travel the globe to help those in need. To learn more about Suncreek Global Ministries click here.